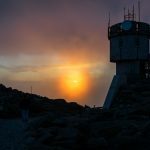 Editor’s Note: Neil has been a member of the Mount Washington Observatory for many years as a volunteer, professional, Seek the Peak participant, and more. 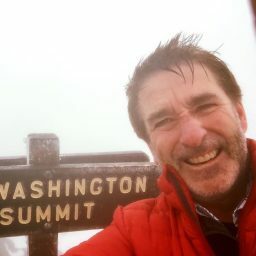 He’s summited the mountain more than 20 times, many of which are shared on his blog, Ramblings From Mount Washington And Beyond. This article was originally published there and reproduced with permission. I texted the picture above to a friend of mine, and she responded with a one-word answer: “Brrrrr!” She nailed it. When I first took a look at the screen, I had to do a double take and then a triple take. This can’t be right—a wind chill of 64° F below zero!? It was really cold all day, with temps hovering at zero wind chills, dipping to -15° to -20° F, but when the sun went down and the wind kicked up and the temps plummeted, the Mt. Washington weather I had come here to experience reared its gnarly head! The day started out like the last few. Jules and I were in service mode, waiting for a cat-trip to arrive. We prepared lunch, coffee, and snacks. The morning weather was cold, snowy, and socked in. I needed to get outside and play a little, so I geared up, took out my camera, laid down in the snow, and got close and personal with a few rocks. 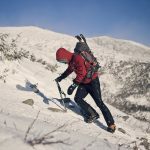 I noticed as I shot, my camera bag and I were being overtaken by rime ice. The rime was growing on my clothing like moss on rocks. I find that an amazing phenomenon. I was getting cold and had work to do to prepare for our guests, so I cut my photo shoot short and headed back to the OBS. As I walked by, I noticed a State Park worker doing some snow-blowing under the overhang leading to the Sherman Adams building entrance. I immediately went over to investigate! I was fortunate to capture the State Park worker taking his last swipe at throwing a lot of really good ski pow into what looked like a great never-ending abyss of nothingness. 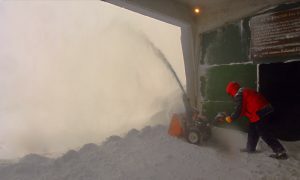 He and I exchanged pleasantries, and then, I watched as he wheeled his snowblower back into the shelter and out of view. I moseyed on back to the OBS and worked on lunch for our upcoming guests. We listened as Slim, who was driving the cat up the mountain, broadcast their locations. He was taking it slow and cautious, as Auto Road visibility was sketchy at best. They made it up some 45 minutes later than expected and, upon arrival, unloaded a boatload, or should I say cat-load, of frozen food supplies for the OBS. I immediately noticed the day-trippers were really psyched to be up here. They were smiling, taking pictures, and asking lots of questions. 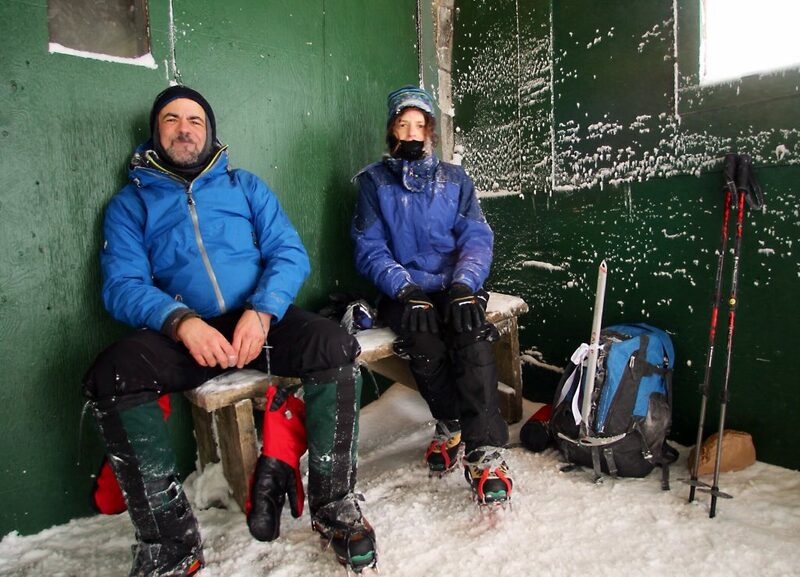 We fed them their lunches, they were gracious, and then, off they went to do their thing on the summit. Jules and I cleaned up, high-fived each other in the knowledge that our major work for the trip was done, and went to gear up for the cold outside. I wanted to get a few shots of the cat as it left the summit, so a few minutes before their departure, I headed out the Sherman Adams entrance. As I did, I ran into two hikers, one male and one female, both resting after a successful summit. I went up to the male hiker and asked his name, as he looked familiar. He said his name was Mike, and I realized right away he was a guy I had met a couple of times and is a member of an online hiking group of which I’m also a member. We spoke for a while, and I wished them a safe hike down, asked them if they needed water or anything (they didn’t), and ventured back into the OBS. It was neat running into them. After dinner, we started getting comfortable and settled in to watch some TV. The winds were howling through the stove-hood vent in the kitchen, clicking and clanging. Loud popping noises, sounding like cars crashing into the building, kept happening. “What is that?” I asked. “It’s the building settling in the cold,” said Mike, one of the weather observers. It was now more than just cold out there; it was downright ridiculous! 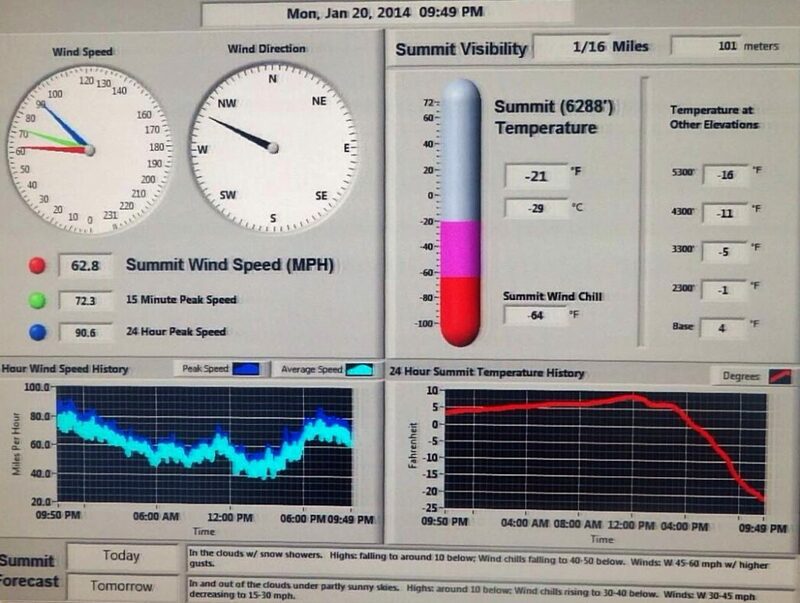 The winds were gusting to 80 mph, sustained in the 60 mph range, and the ambient temps were now around 21 below zero. 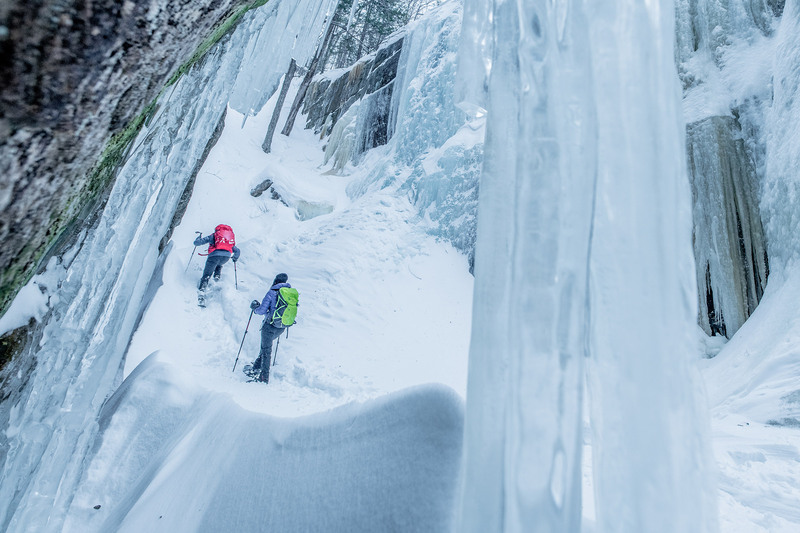 The windchill clocked in at minus 64 degrees below zero. Wow! Around 10 p.m. Jules decided he wanted to go out and experience what was going on. I was quite comfortable, but because I was pretty much still in my hiking gear, I agreed to join him. All geared up, we headed out. Upon opening the door, we heard a sound we hadn’t heard all trip. We’ve heard the roar of the wind, but this sounded angry—a loud, freight train-like roar. Tentatively, we stepped from the shelter of the deck’s A-frame and were immediately hit by the punch of a cold, powerful invisible energy. I experienced stronger winds during the last winter I was here, but I’ve never stood in colder winds. After I mistakenly left a tiny part of my coat unzipped, the wind rushed down through it, hit my back, and felt like a knife slicing my skin. To stop the pain, I quickly zipped up my coat. Jules was snapping photos of a crazy red moon, as it darted in and out of cloud cover. I didn’t bring a camera, so I ventured to the southern part of the deck, where the winds were coming in head-on. I braced my hands upon the railing and let the wind have its way with me. 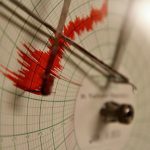 It was like being in a wind tunnel, sustained with strong, intermittent gusts pounding against you with great might and fury. 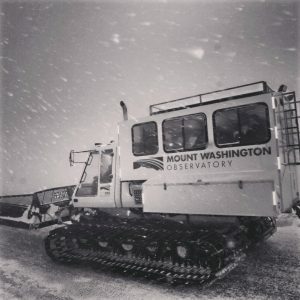 It was an exhilarating, extreme, and amazing experience! Meanwhile, Jules was running around, snapping shots of anything. 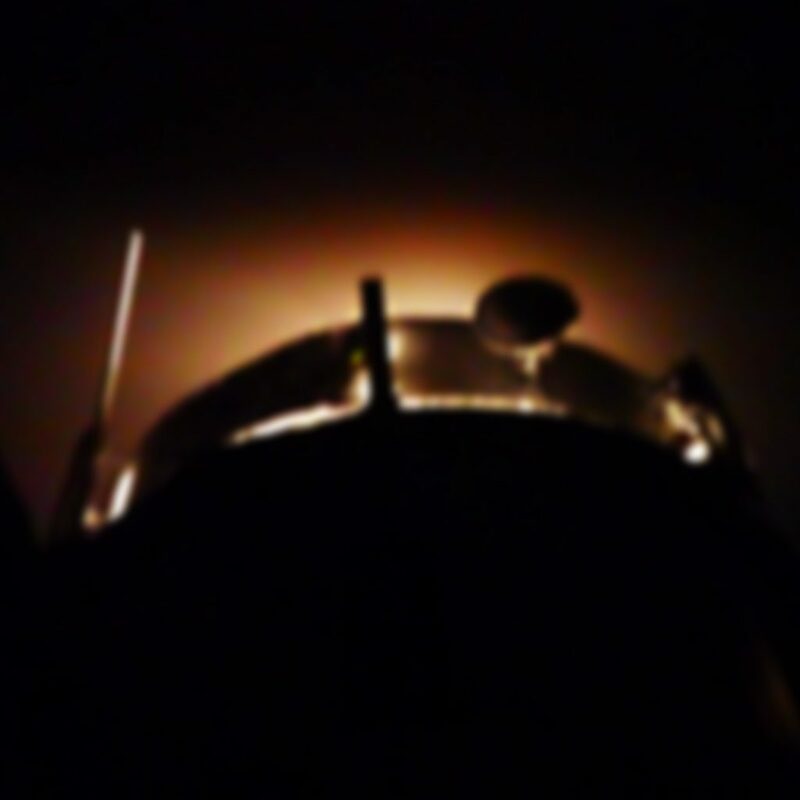 The OBS tower was lit up, and he got a shot of that. We went inside, and Ryan, the night weather observer, was in the Observatory office. Busting in, we began crowing about the awesome experience we just had. Ryan suggested we get a bucket of water and head out to the Sherman Adams entrance, where it is lit, take the water, and throw it into the air. O.K., I thought, let’s do that. Like kids, we were jumping up and down, yelling, screaming, hooting, and hollering! Shear bliss! The water experiment was a highlight of our trip. It came at a great time, and it really encapsulated why we came to live on Mt. Washington. Upon getting into bed, I listened to the howling wind and the loud crashes of the settling building, and I smiled, with a new perspective coming out of an awesome day. I know this type of thing isn’t for everybody, but it sure as hell is for me. I have been an employee benefits consultant and broker for over 30 years and have been employed with my current employer, CGI Business Solutions, for almost 13 years. 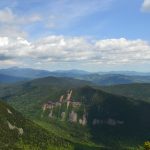 I'm an avid outdoors enthusiast, have completed The AMC NH 48 4000-footer list, having climbed most peaks multiple times. My dog Maggie completed the list this past summer. I'm also a co-founder and original board member of Make A Wish of NH. I live in Gilford, NH with my wife Karen. 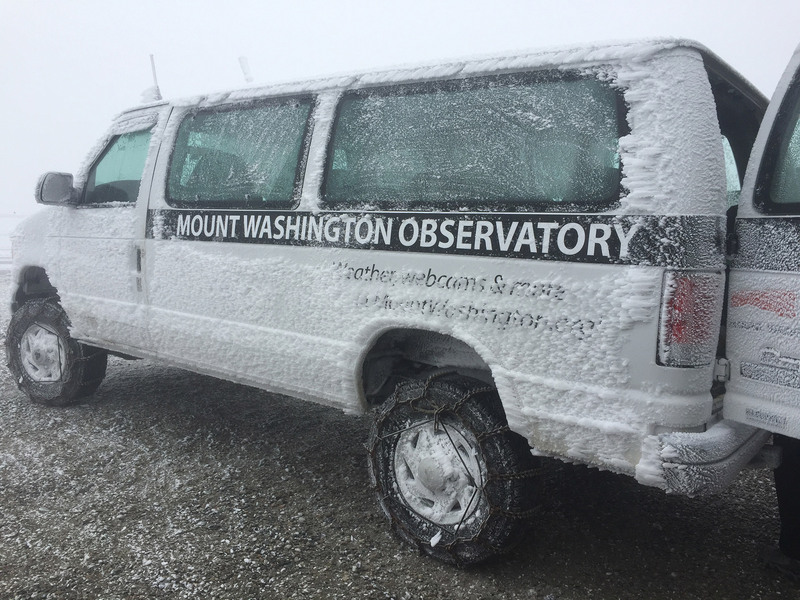 Win a One-Night Stay for 2 to the Mount Washington Observatory!